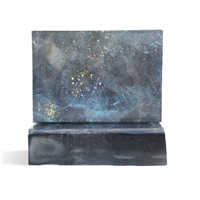 These soaps are “out of this world”! Each bar is uniquely different and has a 3-dimensional look. 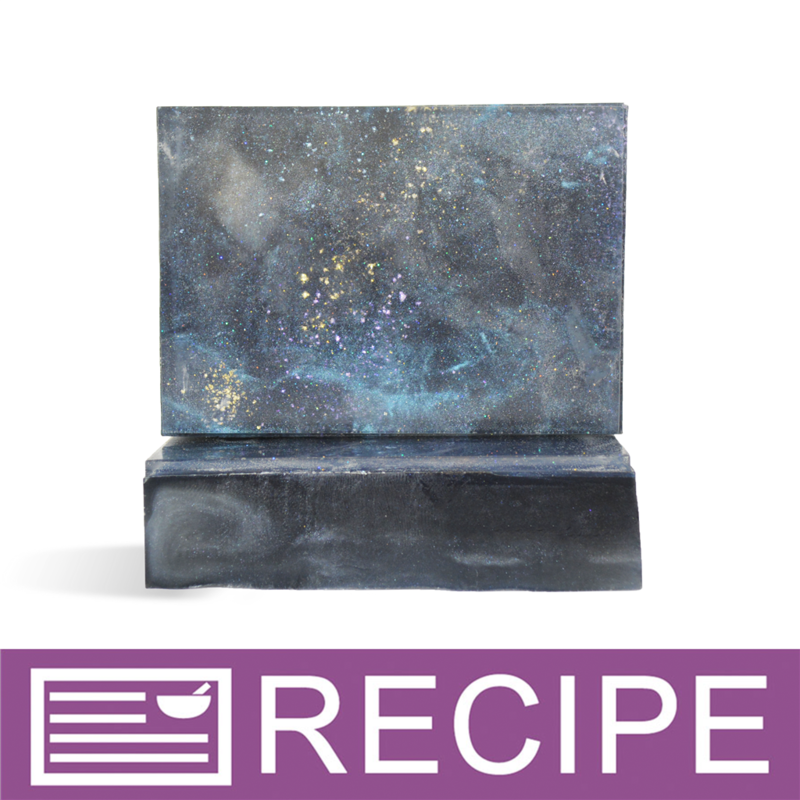 These galaxies are not light years away and may quickly become a best seller! INCI Ingredient Label: Sorbitol, Propylene Glycol, Sodium Laureth Sulfate, Stearic Acid, Lauric Acid, Water, Sodium Hydroxide, Glycerin, Mica, Myristic Acid, Sodium Cocoyl Isethionate, Glycerin, Fragrance, Mica, Titanium Dioxide, Iron Oxide, Ultramarine Blue, Fluorphlogopite, Tin Oxide, Glitter. 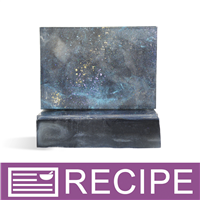 Fill powder spray set with celestial blue powder and set aside for later. In funnel pitcher, melt 5 oz. extra clear soap. Add ½ micro scoop of iridescent super sparkle glitter. Pour quickly into the tray mold moving around if necessary to make sure the entire surface is covered. Spritz with rubbing alcohol. Quickly sprinkle one or two of the highlight white colors across the clear soap. Try making small clusters of sprinkles, like stars in a galaxy. Melt the remaining 5 oz. extra clear soap. Add another ½ micro scoop of iridescent super sparkle glitter. Spritz the soap in the tray and quickly pour the melted soap over the back of a spatula into the tray mold. Make sure the entire surface is covered and spritz with rubbing alcohol. In the same way, sprinkle the remaining highlight white colors across the clear soap. Spray blue mica in random areas across the mold. Allow to harden completely. In separate funnel pitchers melt the black and silver soap. In plastic beaker, combine fragrance oil and vanilla color stabilizer. Allow to sit for at least 2 minutes. Pour half into black soap and other half into silver soap. Allow the soaps to cool to approximately 140ºF. Spritz the soap in the tray, and starting with half of the black soap, pour the melted soap over the back of a spatula into the tray mold. Alternate pouring black and then silver soap to get a swirled look. Spritz with rubbing alcohol and allow to harden completely. Unmold and slice into bars. Wrap with plastic wrap.